Police Chief Josie Gray wakes in the middle of the night, sure that she’s heard a car slowly passing by her remote homestead. When she goes outside to check, she discovers a woman, mute with shock and terror, hiding on her porch. And when she explores the field nearby, she comes across the body of another young woman, shot and killed. Located on the border of Texas and Mexico, the small town of Artemis has become a way station for the coyotes who ferry immigrants across the Rio Grande. But they usually keep moving north, to cities where they can blend into the crowd and pass by unnoticed. Why would these women stick around in Artemis? As Josie investigates the murder and tries to learn the identity of her uninvited houseguest, she discovers that not everyone in town has stayed out of the trafficking business, and someone may play a bigger role than she ever expected. 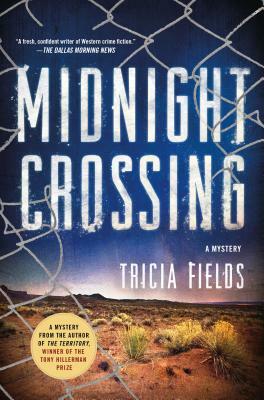 The fifth book in Tricia Fields’s Hillerman Prize–winning series, Midnight Crossing captures the raw natural beauty of West Texas and the tough, independent people who choose to live at the very edge of the country.